Pumpkins are supposed to be scary! The outrageous follow-up to last Halloween’s surprise bestseller. 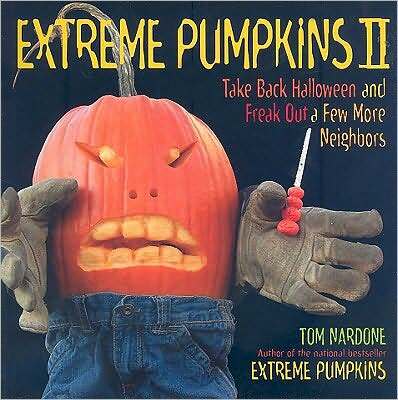 From the power-tool wielding author of the national bestselling Extreme Pumpkins and the popular website Extremepumpkins.com comes a new collection of even darker, creepier, and more outrageous do-it-yourself designs to impress friends and horrify neighbors. The demented designs include Projectile Sneeze Pumpkin, Baseball-in-the-Eye Pumpkin, Doll-Eating Pumpkin, and Full-Diaper Baby Pumpkin, along with cool gourd designs, practical jokes, and more. This gleefully gory guide reclaims Halloween from the cheerful, the cutesy, and the parent-sanctioned.